Still, he was interested enough to let REGEN evaluate one of Rogers’ buildings, the Sandstone Manor call centre just east of Toronto. After he read the analysis of the potential savings and risks, consulted with building operators and got answers to a barrage of questions, he agreed to a pilot test. The approach snagged Asani’s interest, as it offered a simple and affordable way to automate the company’s HVAC systems. He already knew about more centralized and costly building-automation systems that control HVAC and other variables such as lighting to reduce energy use. But those more comprehensive systems didn’t make sense for this call centre, which was too small and wouldn’t achieve enough energy savings to justify the investment. REGEN’s technology, on the other hand, made it possible to reduce complexity and capital cost by focusing only on HVAC units, which typically make up 41 to 52 per cent of commercial buildings’ energy consumption. For each HVAC unit, customers pay only $1,200 to purchase and connect a controller. On top of that is a $1,200 charge for a modem, about $600 a year of telecom costs, and a small annual fee that goes to REGEN, according to company spokesman Michael Rose. The controllers are quick to install, said Rose, adding that customers typically enjoy a two-year payback on their investment. For Rogers, REGEN estimated it could save the call centre 55,831 kilowatt-hours annually, reduce carbon emissions by 9,500 kilograms, and cut peak-power usage by 19.6 per cent. The cut to peak power is important. Building owners in many jurisdictions are charged a premium if their power demand exceeds a certain level during the day, so there are financial benefits to staying below those demand thresholds. Typically, HVAC units handle their own areas individually, meaning they turn on when the temperature in that area falls outside of a specified range. But that means all the units in a building sometimes run at the same time – driving up peak-power demand – instead of alternating to even out the power use. Some units get overused, causing maintenance and reliability issues, while others remain underused. 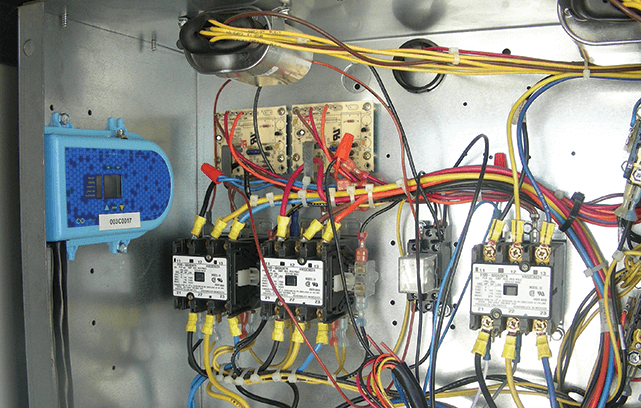 REGEN’s controllers offer more value, as they communicate with each other via an Internet modem and coordinate when to turn individual HVAC units on and off to smooth the system’s power usage and maximize operating efficiency. They also shut the HVAC units off when associated parts of the building are closed. The Rogers pilot test ran from September to November 2011, during which time 15 of REGEN’s HVAC-connected controllers were able to slash off-hours energy consumption by 66 per cent. Highest energy use happens on hot days, so REGEN is waiting for the summer to assess the Sandstone Manor system’s ability to reduce peak-power consumption during business hours. But based on its other clients, REGEN expects the system to deliver a 15 to 20 per cent reduction in peak demand, said Rose. Who else should consider this? Ideal candidates should have at least six HVAC units with capacities of at least five tonnes each, Rose said. Big-box stores, for example, are often perfect because they tend to have big open areas with plenty of HVAC units on the rooftop, and fairly regular business hours. Based on results so far, Asani is already considering installing the system in another Rogers building.